tn8 who sang a SuperCollider love song ("I love you sooooo much more than Max"), but then she went CRAZY! Standing on a table she demanded to know if there were any Max/MSP users in the audience, zapping them with a massive water-pistol that triggered zappy sounds in SC. Then she carried on but forced SC to crash, and pushed her laptop off the table onto the floor (to screams of horror from the audience). Then (understandably) the sound cut out. Blimey. Timeblind really rocked. I love the texture of his stuff - lots of beats and sounds kind of trying to push through, but none of them ever completely takes over, so it's always really rich-textured. I like the reggae and dancehall flavour too. I danced my little socks off. Sam Pluta lulled us into a false sense of security for a while before bursting into a load of really delicious glitchy noise (made out of gamelan samples sped up to about a hundred times their normal speed), with really well-matched visuals. 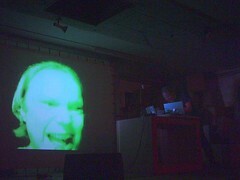 redFrik's music was fun and mischevious, a perfect use of the retro 8-bit emulated sounds he was using. 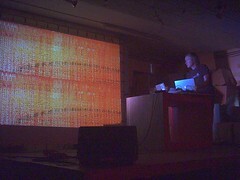 He was also making live improv visuals at the same time, and it almost distracted me from the music, watching him fiddle about with a video camera and his laptop.